If two ships are both positioned exactly on the Equator but are separated by 900 nautical miles in an east/west direction, then in terms of longitude, they will be 15o apart and in terms of Greenwich Mean Time, they will be 1 hour apart. If however, they both move to latitude 50oN maintaining a distance of 900 nautical miles between them, they will find that their difference in longitude has increased to 23o.36. and their difference in GMT has increased to 1.5 hours. Longitude and Distance at the Equator. The Earth’s equatorial circumference is 21639 n.m. Since the Equator is a great circle, 1o will subtend an arc of: 21639 ÷ 360 = 60.1 » 60 n.m. There are 360 meridians of Longitude so it follows that, measuring from the Earth’s centre, the angular distance between adjacent meridians at the Equator is 1o. Since, as calculated above, 1o subtends an arc of 60 n.m. it follows that the distance between adjacent meridians of longitude at the Equator is 60 n.m. Returning to the original question, the distance between the ships when measuring along the Equator, is 900 nautical miles. Since, as explained above, the distance between adjacent meridians of longitude at the Equator is 60 n.m, the difference in longitude between the ships must be 900 ÷ 60 = 15o. in 4 seconds it moves 1′. From this, it becomes obvious that there is a direct relationship between arc and mean time such that 1 minute of time equals 15 minutes of arc. We know that the angular distance between meridians of longitude at the Equator is 1o and that 1o equates to 4 minutes of time so we can conclude that the mean time difference between adjacent meridians of longitude is 4 minutes. Why Greenwich Mean Time. Greenwich Mean Time (GMT) is the local mean time anywhere on the meridian of Greenwich. Since the Greenwich meridian is used as the base meridian from which the longitude of all places on Earth are identified, it follows from the discussion above, that GMT provides the link between the longitude of a place and the longitude of Greenwich. Therefore, if we know the longitude of a position on the Earth’s surface, we can easily calculate the GMT at that position since 1o of longitude equates to 4 minutes of GMT. Alternatively, we can calculate the longitude of a place if we know the GMT there. Returning to the original question again, we have calculated that the ships are separated by 15o of longitude which in terms of GMT, equates to a time difference of one hour. Note. Universal Time (UT). The term Universal Time was adopted internationally in 1928 as a more precise term than Greenwich Mean Time, because GMT can refer to either an astronomical or a civil day. However, the term Greenwich Mean Time persists in common usage to this day and is generally considered to be synonymous with the term Universal Time. It should be noted that the Nautical Almanac and other tables of astronomical data usually refer to UT instead of GMT. Longitude and Distance Along a Parallel of Latitude. 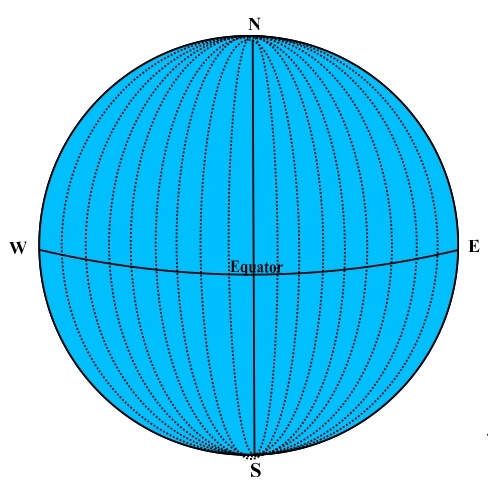 The diagram below shows that, as the meridians of longitude move away from the Equator, they draw closer together until they eventually converge at the poles. In the next diagram, the arcs AC and BD lie on different meridians of longitude. 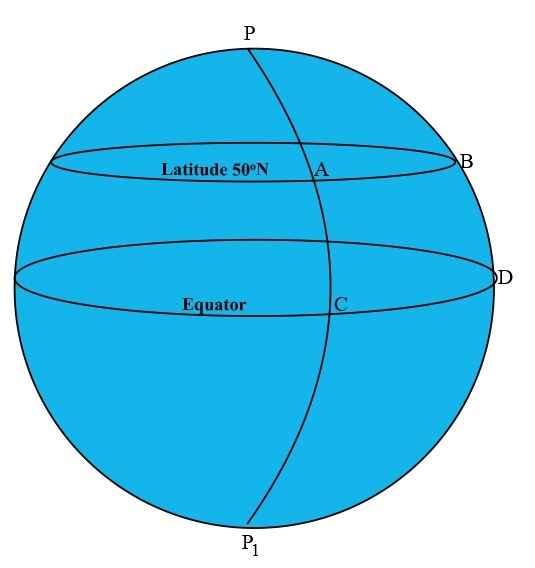 The arc AB is the distance between these meridians measured along the surface of latitude 50oN and the arc CD is the distance between the same meridians measured along the Equator. Clearly, the distance CD is much greater than the distance AB. To Calculate The Distance Between Two Meridians Along A Parallel Of Latitude. The following formulae are used for calculating the difference in distance along a parallel of latitude (Ddist) corresponding to a difference in longitude (Dlong) and vice versa. The formulae are simply stated below without explanation but if you wish to see a full explanation of their derivation then click here). To calculate the difference between them in terms of GMT we proceed as follows: 23o.33 ÷ 15 = 1.5 hours (since 15o of arc equates to 1 hour of mean time). A more detailed treatment of this topic can be found in the books listed below.